Trapping Raccoons - SIA Wildlife Control Inc.
Raccoons in Ontario can a menace to private property. By this we mean feces, sod destruction, and generally being aggressive towards pets and homeowners. 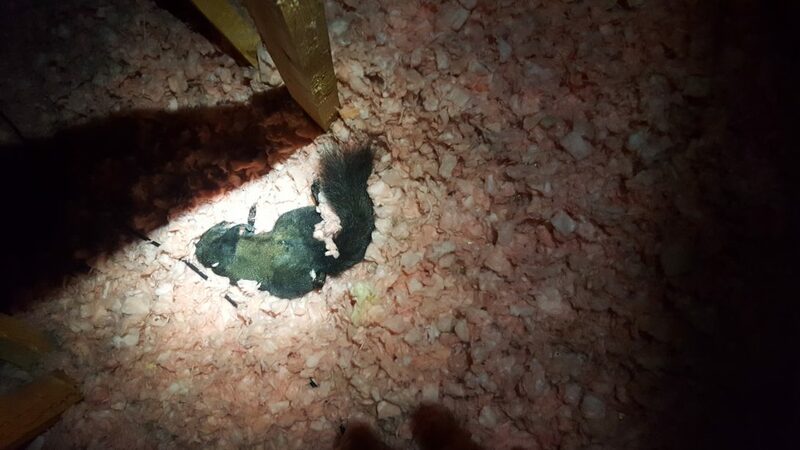 As wildlife professionals we use trapping as a last resort raccoon removal option when other options are not possible. This is raccoons in open space such as a backyard or a balcony. How do you know you have a raccoon roaming your backyard when you’re a sleeping? Look for evidence. There are several ways to tell, obviously the first is visually spotting them during the day. But chances are they’ll be roaming in the middle of the night. Raccoon feces look like dog feces more or less, if you don’t own a pet it should be much easier to tell new feces in the backyard. Look for dug out dirt, sod, anything in the perimeter of a shed, home, deck, or porch. We recommend a close up inspection of the hole, it may reveal animal fur which has been trapped on the edges of the entry point. 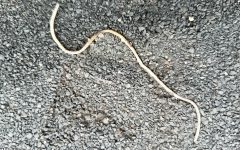 Raccoon feces may contain Round Worms. Don’t have Adobe PDF reader? download here. We recommend not to perform your own feces removal, unless absolutely necessary to do so. For example, you aren’t exposed to feces in your attic, so it is not absolutely necessary for you to clean up raccoon feces within the attic. If you must remove raccoon feces, make sure you are well educated and take necessary safety precautions. You are encouraged to do your research, however we are providing a CDC guideline here. Better yet, hire a professional cleaning company that deals with raccoon feces. Proper raccoon removal via trapping requires food, raccoon shelter area, and trap location. It is important to know where your raccoon is resting during the day so you can properly open a can of food and let the smell breeze in. Once the food is inside the trap within the shelter’s vicinity, the raccoon will do the rest. Remember that raccoons can climb, and skunks don’t! That’s a tip you may use one day so you don’t find yourself staring at a skunk who is about to spray your way! 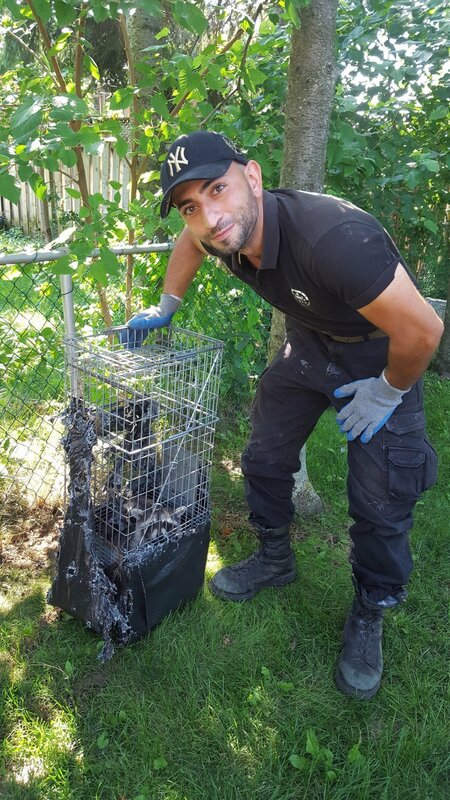 Finally, once caught you may relocate or hire a professional to relocate your raccoon. Keep in mind that city law dictates that when relocating, the maximum relocation distance is 1km. Do not attempt to pet the raccoon. Never trap and relocate a raccoon in March (baby season). 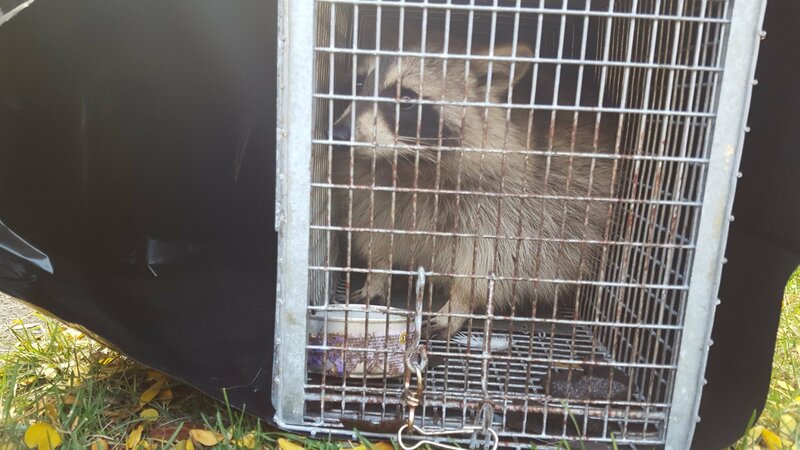 Refrain from releasing raccoons near roads, highways, or areas with vehicle traffic. A trapped raccoon may defecate before, during, or after seeing you approach. Hold the trap away from your body during transportation. A trapped raccoon is still dangerous. Don’t underestimate raccoon strength, use a trap designed specifically for a raccoon. Raccoons will destroy sod, objects, carpets, or anything of value underneath or near the trap while attempting to escape.